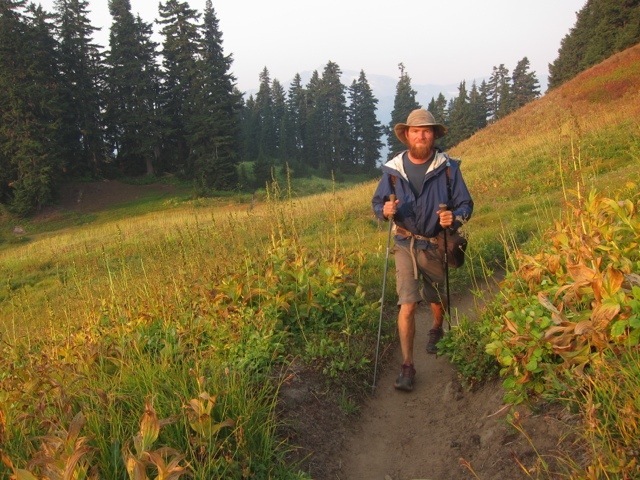 Each day on the Pacific Crest Trail is packed full of memorable events. In this post, to better share the variety of our daily experiences, we focus on a single day, day 156, with only one highlight from each of the other days. After getting a hitch back to the PCT from Baring, we climbed up through the trees. The highlight of the day was our campsite with panoramic mountain views and Glasses Lake far below. 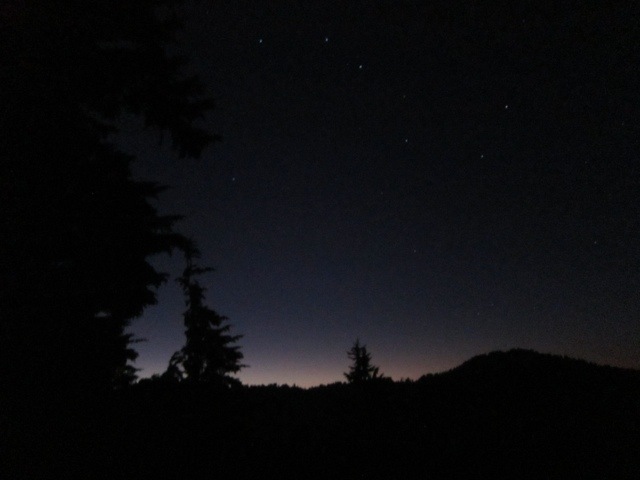 We enjoyed a romantic dinner of mac and cheese as the sun set, and the stars began to appear. The theme today was Glacier Peak. We watched its steep, snowy slopes grow larger as we walked north. 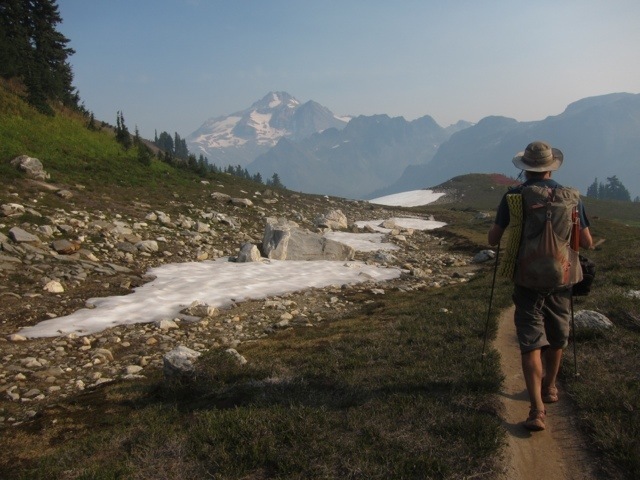 At the end of the day we entered the Glacier Peak Wilderness. 6:15 As we woke, the smell of smoke from a distant forest fire drifted through the air. Smoke cast a haze over the landscape as we packed up our gear. 7:15 Feeling fresh and energetic, we got to walking. 8:15 After climbing for a while, we passed the tree line into drier, shrubbier terrain. Overheating, we stopped to take off our jackets. A large bird of prey flew past. 9:45 Completing 1500 feet of climbing (roughly the height of the Empire State Building), we reached Red Pass. A fellow thru hiker named Nugio was resting at the top, and we chatted with him briefly before walking down the other side of the pass. 9:50 The large bird flew by again. We thought it was an eagle. 10:45 Our descent continued through meadows, rocks, snow, and finally into a forest. The descent from Red Pass totaled 2700 feet, even more than we had climbed earlier. 11:00 Our map showed a number of silty glacial water sources ahead. Because silt clogs water filters, we elected to stop for an early lunch at Swelling Creek. We filtered the clear, cool water to drink and cook. 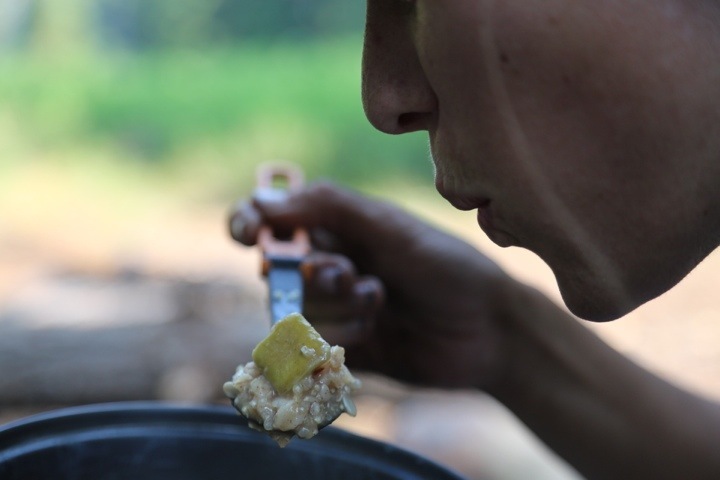 The delicious dish of the day was Outdoor Herbivore‘s apple quinoa oatmeal. 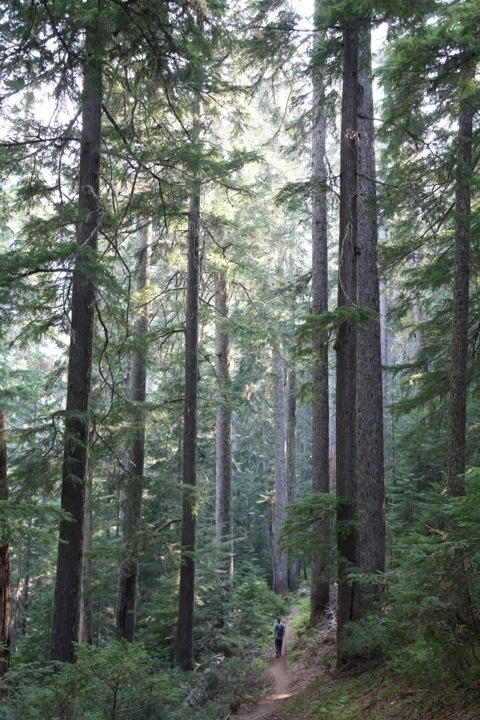 12:00 After lunch, we entered a towering forest, which cleared smoke from the air. 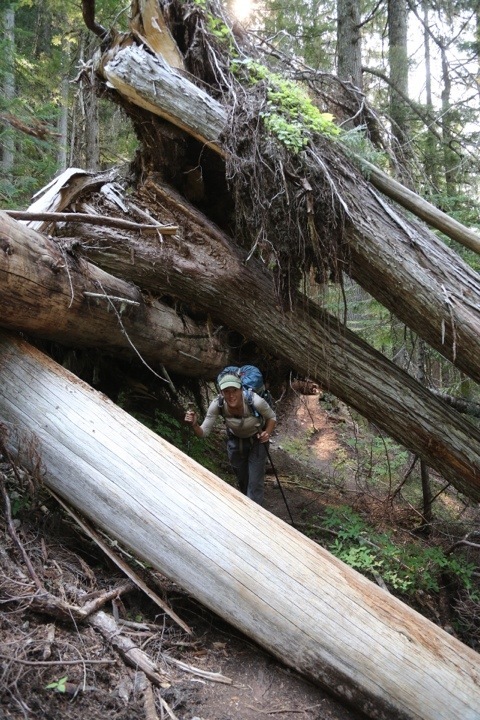 12:15 We crossed several creeks, and maneuvered over, around, and under numerous downed trees lying across the trail. 1:30 Trees had dropped a soft spongy carpet of pine needles on the trail, which made walking fun. 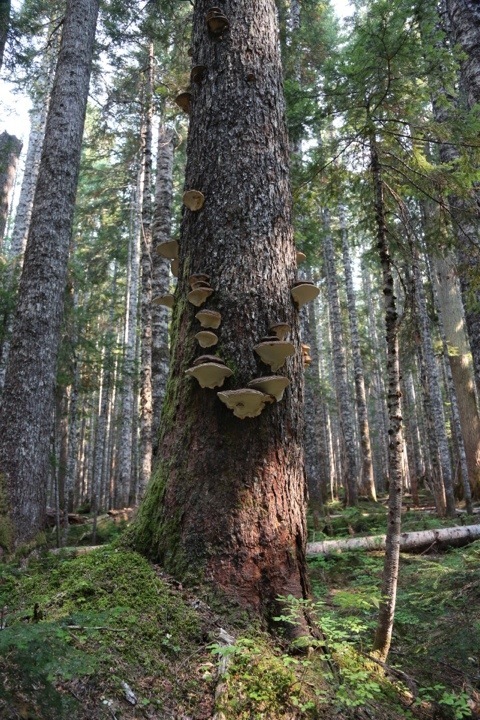 Dead trees sprouted mushrooms aplenty. 2:45 At Kenny Creek, we crossed a log bridge that had cracked in the middle. 2:50 We began a 2300 foot climb. The Cascades are steep! 3:45 Sweaty and tired, we took a break at a creek, where we filtered water. 4:15 Somewhat rested, we continued climbing. 5:00 We crossed beautiful creeks cascading down the mountainside. Shutterbug shutter bugged. 5:10 A black bear startled us as it browsed for berries near the trail. We must have surprised it too, since it ran quickly down the hillside. 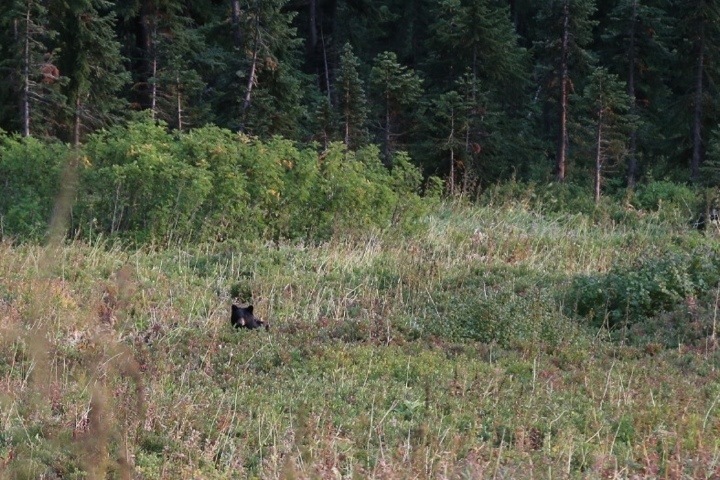 Once it was farther away, the bear paused to stare back at us before disappearing into the brush. 5:15 We hiked on, climbing above the tree line. 7:00 As autumn draws near, the sun sets earlier, translating to shorter hiking days. 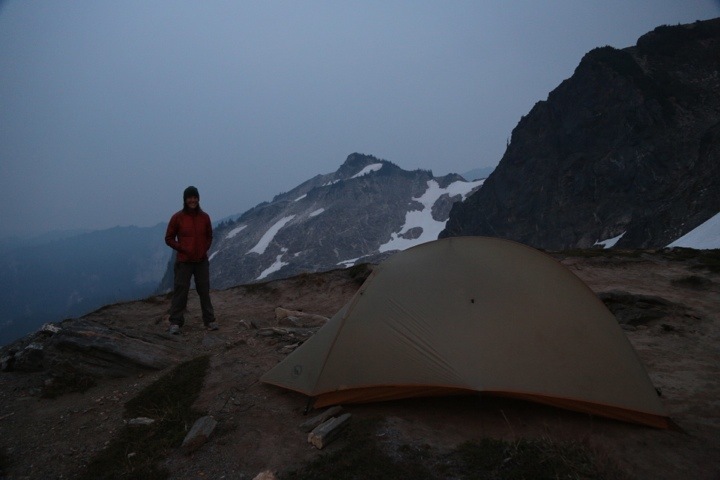 Before darkness fell, we found a gorgeous campsite above a deep cloud-covered valley. 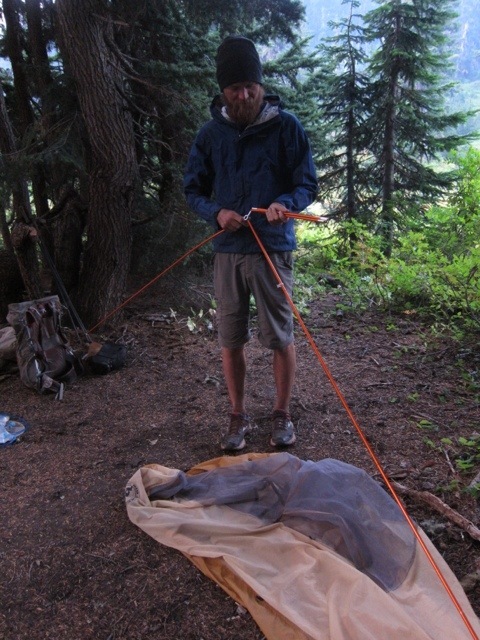 8:00 After a quick dinner, we latched our bear can lids and crawled into the tent. We were soon asleep, resting up for tomorrow’s many adventures. Beautiful trip guys! I’m good friends with C. Giffen (childhood friends) and saw this on his FB a while back. 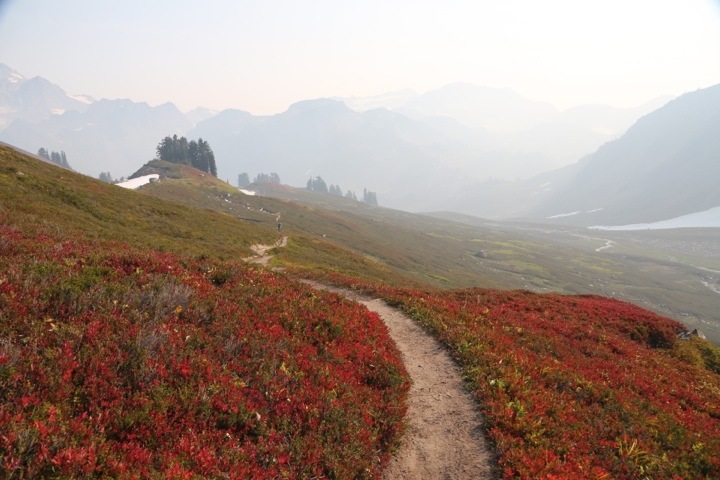 I was just up in the Methow Valley a few weeks ago hiking around Rainy Lake and Ann Lake, you may go by them soon! 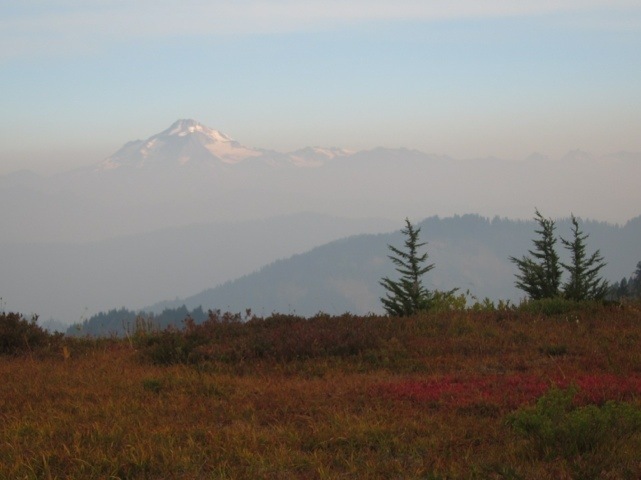 Hope the smoke isn’t too bad for breathing and views, the fires near Wenatchee and Ellensburg are pretty big. Happy trails! Cheers, Travis! The smoke comes and goes depending on the wind and our altitude and location. Fortunately it died down in the last part of the hike. This was our first time hiking in Washington, and we loved it! 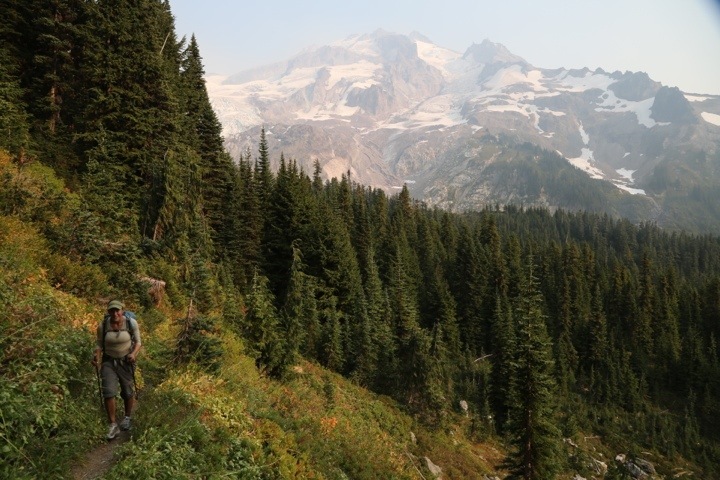 Those pics of glacier mountain make it seem unreal — like an enchanted land. And like Mt. Fuji. Anna, your lungs are as okay with the smoke as Chris’? I thought you might have more difficulty. I’ll miss your blogs. 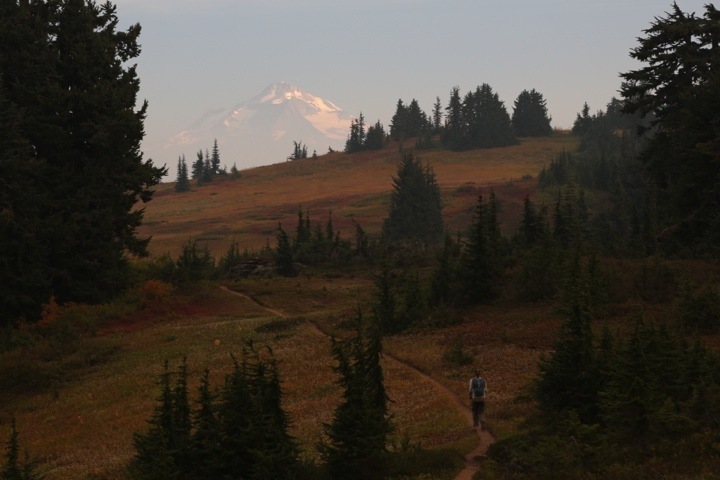 Any chance you’ll keep on, even when no longer on the PCT? We have seen a lot of unreal views like that recently, and it is amazing to witness such things. I like your comparison to Mt. Fuji. It’s appropriate since Glacier Peak is also a volcano. You’re spot on, the smoke gives Anna headaches sometimes, which is a pain. She can still put in the miles regardless, but it can be more difficult. We were happy that the last bit of the trail was smoke-free. We absolutely plan to keep blogging now that we’ve finished the trail. What form the posts take will depend on what form our adventures take, but don’t despair, we aren’t finished posting! It’s been so awesome keeping up with you two and seeing your progress. Your pics are amazing. Thank you Willie, we’re so glad you are enjoying following our adventures! 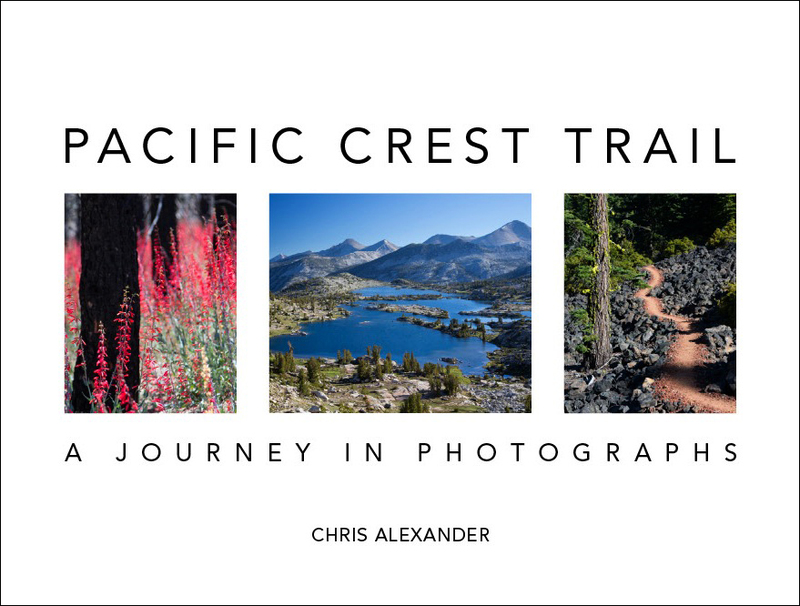 Shutterbug is going to create a PCT photo book, which will be a way to see more. Ah, nice chin strap tan line, Anna! It’s just an errant strand of hair! Love watching your progress and seeing Shutterbugs pictures. I’m the “old guy” with the yellow lab you met on the PCT between Opie Dilldock Pass and McKenzie Pass in Oregon. Thanks for showing me the cellphone hot spot in that area. Ah yes, we remember you two! Great that you are following along, and we are always happy to help. You guys are so cool! Did you know that you are now farther north than the northernmost tip of Maine? Wow! You are really close to Canada now. You just passed Seattle’s latitude. Thanks Dante, we love those map-reading insights. We didn’t know how we compared to Maine! Wow, this adventure is awesome to look at with my kids. Thanks for sharing and inspiring them with your beautiful pictures. Thanks Elaine, we love to hear that. It’s wonderful that your kids are so excited about this outdoor adventure! My favorite picture: Anna eating the oatmeal apple quinoa. Yum! That last picture looks as though you are camping on top of the world! I can’t imagine waking up to a view like that. We couldn’t really imagine waking up in a place like that either. It just happened and we gawked at it! I remember you used to make me oatmeal and you’d cut up an apple and add it. I always loved that, and I even mentioned it to Anna as we were eating this meal. It was great! How many days until you reach the Canadian Border? You seem to be getting close, and you cover a lot of ground each day. After the rest day in Stehekin, we completed the trail in about 4.5 days. There was a lot of beauty in that section! 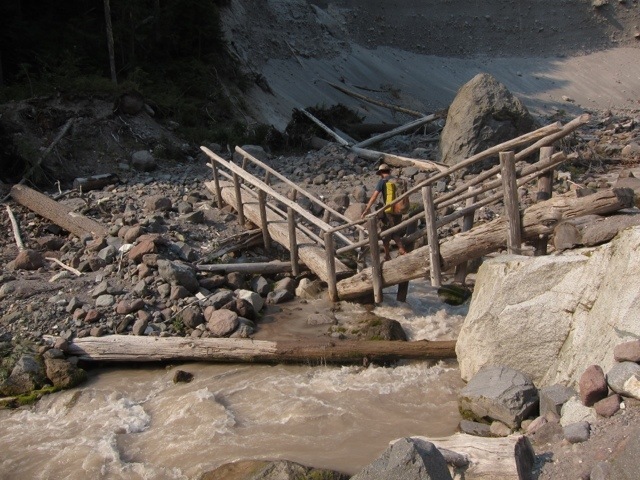 Look like an awesome hike (Kenny Creek broken bridge), some great pictures. Only dream doing hikes like that. It was a great hike, with some sort of challenge each day. Sometimes a broken bridge, sometimes downed trees, and sometimes a mountain to ascend. 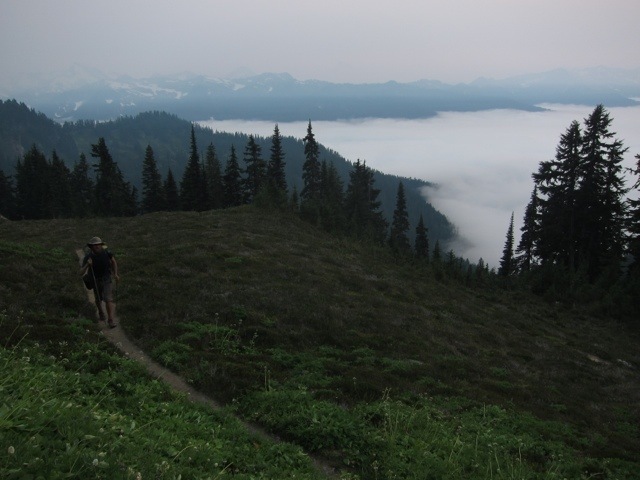 You could enjoy portions of the PCT in shorter backpacking or day hike sections if you’re interested. 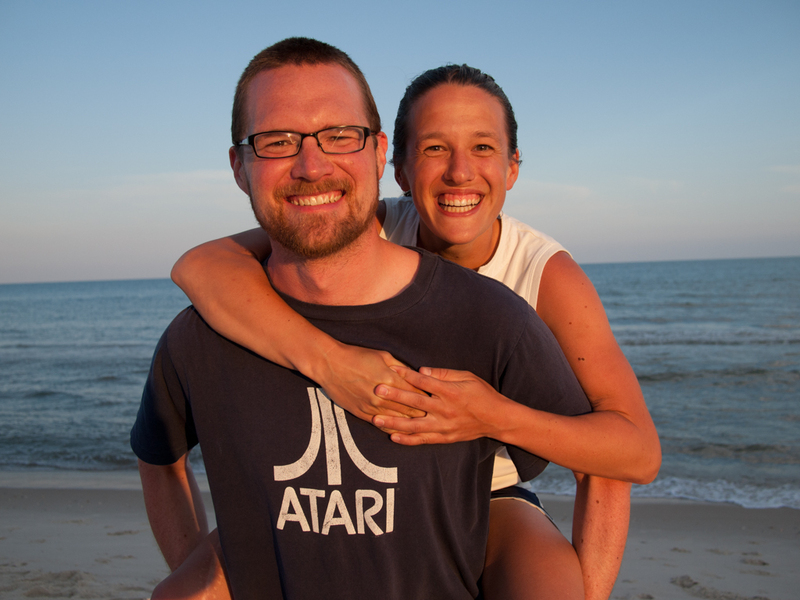 Otherwise, I’m glad we can share the trail with you through this blog. Cheers! 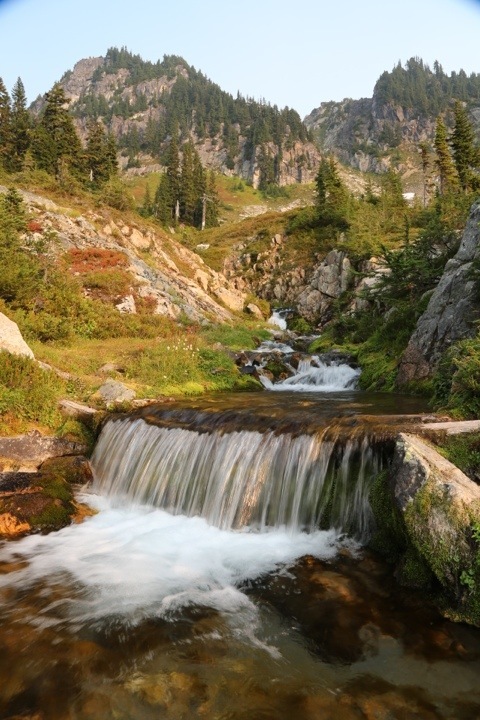 Your photos are always fun, beautiful, and informative, but the photo of the waterfalls belongs on the front cover of a calendar for the Nature Conservancy or some other lucky organization. Thanks Mary! Many of the beautiful creeks and waterfalls we passed weren’t even named on the map, so it was always a fun surprise to come across something like the scene in that photo.